My promo video has been a very helpful tool in showing brides and grooms my non-traditional and indie style of DJing. The couples who I typically work with shy away from traditional and cheesy DJs. Rather, they prefer an indie, urban DJ who is music savvy just like they are. Julia and Derrick preferred the latter. Julie typed "Indie Wedding DJ Orange County" in Google and found my video and website. She reached out to me after watching my video since it matched her sophisticated and very hip taste in music. We then met and talked about their musical tastes and atmosphere they'd love to create, their elegant venue and their special bridal party grand entrance. Both Julia and Derrick are creative professionals who really enjoy music. When we talked about their favorite style of music, artists and the mood they'd like to create for their wedding; I felt like they were giving me the complete freedom to play music appropriate for each event. And they did! They described their cocktail hour as upbeat, bossa nova influenced, and hip. Their dinner music was to consist of love ballads and songs special to them. Below is their playlist for the cocktail hour and dinner. 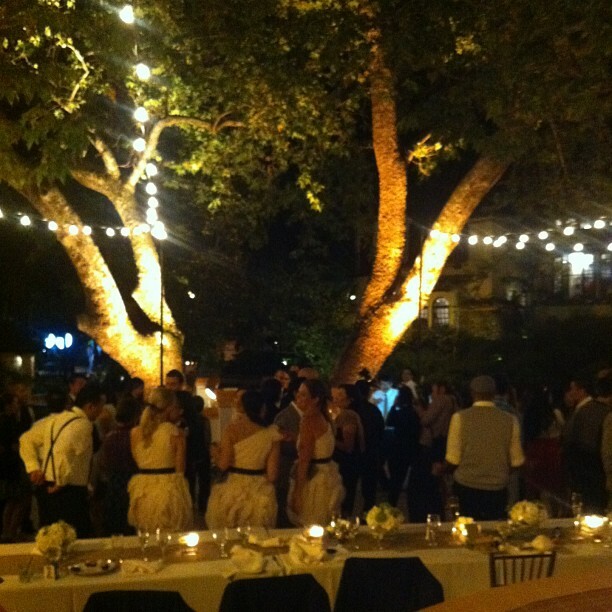 Their venue was at Rancho Las Lomas in Silverado, CA. Silverado is an enclave of ranches and executive homes located in South Orange County and adjacent to Mission Viejo. Rancho Las Lomas is a private and elegant ranch estate with a rustic and romantic setting. There is even a zoological garden on the grounds. Yes, a zoological garden which includes lions, zebras and llamas! The grounds were picturesque. Julia and Derrick wanted to surprise their guests with a very special bridal party grand entrance. They wanted to sing, as a group, "Stand by Me" by Ben E. King. To do so, it required six wireless mics and a mixing board. Thankfully, a friend on theirs is a sound professional and was able to set up the additional system. When the song played, the guys sang the first verse and the girls sang the second verse. Their guests didn't expect it and were surprised! They even clapped and cheered. Throughout the night; some guests were singing along to a few songs I played, and some even bobbed their heads during dinner. Julia and Derricks' friends and family all enjoyed the songs they selected and the ones I included to compliment the overall indie music flavor of the entire wedding. I didn't have a good view of the exchange of their vows, so Derrick text me and other guests the moment they said "I do". Enjoy the amazing photos below!